Recycled paper and petroleum-free resin composite surfaces. 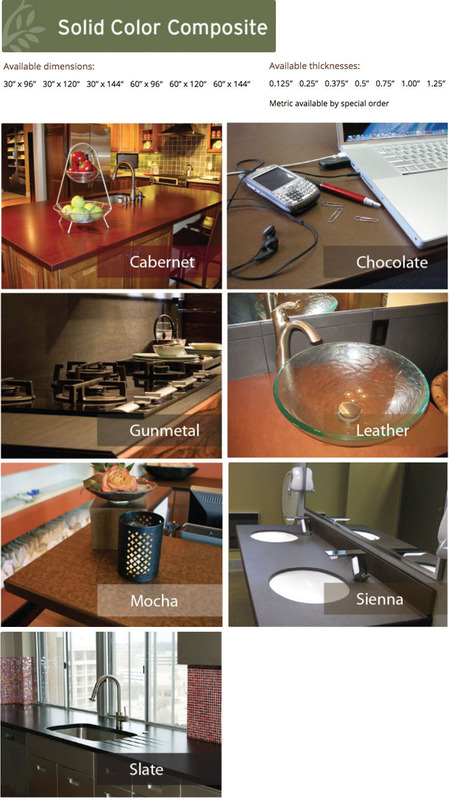 Ideal for countertops in any room, window sills, cutting boards, furniture, and many more creative uses. Standard and custom panel sizes and thicknesses are available. Color Reference Guide - Now offered in lighter shades! Please call for details, to obtain a quote or to place an order. PaperStone® is a unique solid surface made from 100% recycled paper, natural pigments and their proprietary non-toxic phenolic resin. To make PaperStone, the recyled paper is first saturated with the resins and natural pigments. Then sheets of the resin-saturated paper are trimmed to length, stacked together, and fused by both heat and pressure in a press. 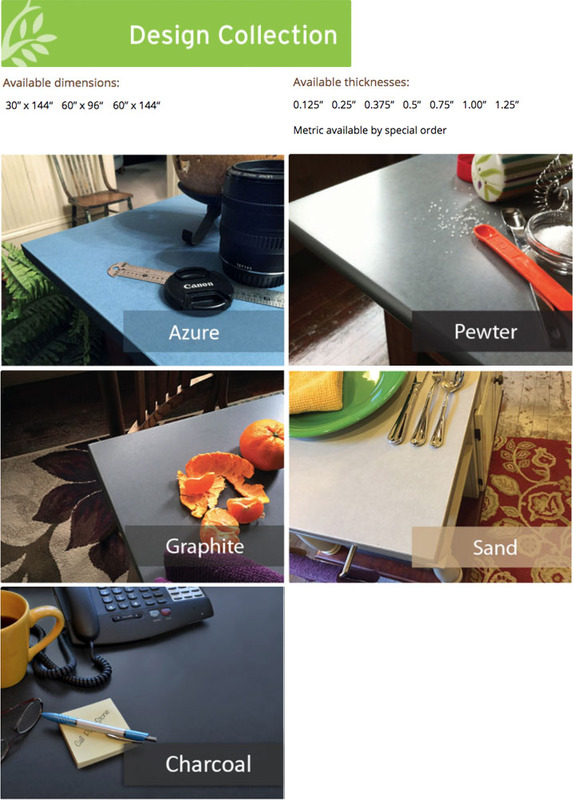 Both durable and easy to install, PaperStone is ideal for use in kitchens, baths and many other creative applications such as conference tabletops, desks and restaurant food prep surfaces. Its unique beauty, functionality and reliability offers an exciting alternative to more traditional solid surfaces. Using pigments rather than dyes assures superior color stability and UV resistance as well as even and rich color distribution that is solid throughout the entire panel. Lifetime product with superior scratch, dent, and chip resistance. Nearly as hard as rock but less brittle than stone or engineered quartz brands, which can sometimes crack. No additonal support or underlayment is required for support of 1/2" or thicker material so it allows for creative cantilivered designs with up to 18-inches of overhang. Natural earth-tone colors offer a warm ambience to any room. Ages like fine hardwood. PaperStone's natural materials will develop softer, richer tones over time as the surface ages. PaperStone is extremely dense and virtually non-porous, which makes it stain resistant and heat resistant. Easy to work with - PaperStone is installed with the same common tools and techniques used in woodworking or stone cutting. PaperStone is a NSF® certified food-safe surface, excellent for those that are chemically sensitive, and makes an ideal restaurant food prep surface. And with proper cleaning, PaperStone doesn't promote the growth of bacteria, mold or mildew! Heat resistant up to 350°F (175°C). High fire resistance; it will not melt, liquify or explode. Wipes clean with sponge and dishwashing liquid. PaperStone’s pricing is comparable to quality granite, solid surface or engineered quartz materials. The ease and effciency of PaperStone’s fabrication and finish often saves on installation costs, making installed project pricing lower. Available in 12 Rich Colors...and now in lighter shades! PaperStone is available in 8 solid color composite shades and now 5 Design Collection shades, created specially for those that wanted lighter colored panels. The new Designer Series formula maintains the durability and workability while achieving a fresh, lighter look. 1/2” (13 mm) panels for use in built-up edge installations are available. Other panel thicknesses and sizes are available by special order.